There was a time, before the age of hybrid crops, genetic engineering and "agribusiness," when fruits and vegetables tasted better. "Wild" salmon and mussels were fished from the seas, not harvested from "farms." Rabbit and hare were hunted, not "raised." Livestock wasn't "beefed up" with hormones. And flavours were different. The good news is that a few of these untamed flavours still exist, and Sicily's wild asparagus offers one of them. This rare delight is picked each Spring in the mountains of Sicily. Like carduna and wild thorny artichokes, it's something you'll rarely find outside southern Italy or a few other parts of the Mediterranean. Wild asparagus acutifolius (shown here) is a country cousin of asparagus officinalis, the common domesticated variety, which has a thicker stalk and sweeter taste. It may even be accurate to refer to wild asparagus as an uncle or aunt of officinalis, but I'll leave that debate to the botanical geneticists. Truth be told, wild asparagus, a perennial, is sometimes grown on farms, but its flavour does not seem to have suffered for the change of scenery. Of course, there is some choice in the matter, as the sweeter, tender "domesticated" asparagus is raised in Sicily and sold in supermarkets. To find wild asparagus you'll probably have to venture into one of Sicily's outdoor street markets during April or early May. 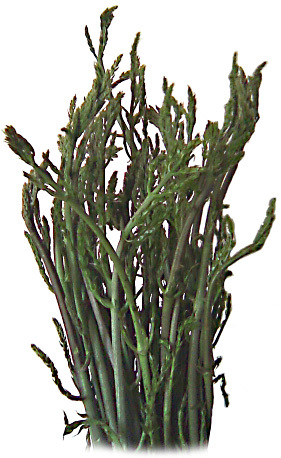 In Sicily the word sparacelli is still used in most regions to refer to wild asparagus, though in the western part of the island sparacelli also refers to wild broccoli. Asparagus, in one form or another, is native to many areas around the world. It is the stalks and buds that are eaten, as the sprouts are picked before they flower. Wild Sicilian asparagus has slender, slightly purplish stalks and a rather bitter taste compared to the more common "supermarket" variety (officinalis) indigenous to parts of western Europe. Asparagus, which is a diuretic, was cultivated by the ancient Egyptians, Greeks and Romans, and a recipe survives from the compilation by Apicius. Low in sodium, asparagus is a good source of several minerals, including magnesium, calcium, and zinc, as well as folic acid, vitamins A, C, E and K, and iron, selenium and potassium. Sparagine, an amino acid, takes its name from asparagus, and is cognate to the Sicilian word sparacelli. The Latin word is sparagus, from the Greek asparagos. The Persian asparag meant "sprout" or "shoot." Asparagus is not the kind of vegetable most of us want to eat raw. Wild Sicilian asparagus is tougher than other varieties to begin with, so boiling is recommended. It's great in a frittata, with sharp caciocavallo cheese.